Kathryn Podrebarac is the founder and Principal of Podrebarac Barristers Professional Corporation, recognized by Lexpert as a repeatedly recommended litigation boutique for corporate commercial litigation. Prior to founding this firm, Kathryn was a founding partner of Tough & Podrebarac LLP and practiced for several years at Blakes, one of Canadaʼs leading national firms. Kathrynʼs practice focuses primarily on commercial litigation and arbitration and class actions. She is also a trained mediator and adjudicator. 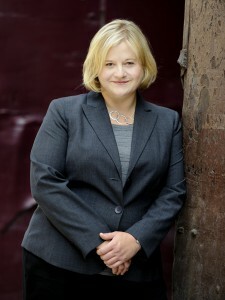 Kathryn has acted as counsel in a wide range of complex commercial disputes involving all types of contracts and commercial torts, including conspiracy, unlawful interference with economic relations, inducing breach of contract, breaches of confidence and fiduciary duties, misrepresentation and breaches of the Competition Act and consumer protection legislation. Kathryn has also litigated a number of oppression remedy cases as well as directorʼs and officerʼs liability cases. Kathryn has enjoyed considerable success achieving coverage for insureds in complex insurance coverage disputes. Kathryn’s class action practice is truly national. She has appeared before the superior courts of nearly every province in Canada as well as a number of provincial appellate courts. She has experience litigating class actions relating to product liability, consumer contracts, breaches of statute, and pensions. In 2011, the Courts of Ontario, British Columbia and Quebec appointed Kathryn to assist in overseeing the ongoing administration of the Hepatitis C 86-90 Class Action Settlement Fund, the assets of which currently exceed $1.2 billion. Kathryn’s commercial arbitration practice is both domestic and international. Following a course of study and successful completion of the entrance examination, Kathryn was admitted as a Member of the Institute of Chartered Arbitrators, the world’s leading professional membership body for arbitration. Her area of specialty is international commercial arbitration. Kathryn currently sits on the Executive Committee of the Institute of Chartered Arbitrators (Toronto chapter). Kathryn is also a trained mediator. She has completed intensive mediator training with leading mediators at Harvard Law School as well as the Straus Institute for Dispute Resolution at Pepperdine University’s School of Law. Kathryn has served as a Director of The Advocates’ Society and as a member of the Executive of the Civil Litigation and Class Action Sections of the Ontario Bar Association. Kathryn is a frequent speaker and co-chair of continuing legal education programs for The Advocatesʼ Society, the Law Society of Upper Canada, the Ontario Bar Association and Osgoode Professional Development. She is also a trained litigation skills instructor for the Intensive Trial Advocacy Workshop of Osgoode Hall Law School and The Advocatesʼ Society. She has published extensively in the areas of civil litigation, evidence and class actions. You can read more about Kathrynʼs speaking and teaching engagements and publications by clicking here.